5.4 Earthquake hits the Guam region. 5.2 Earthquake hits off the coast of northern Peru. 5.1 Earthquake hits off the coast of northern California. 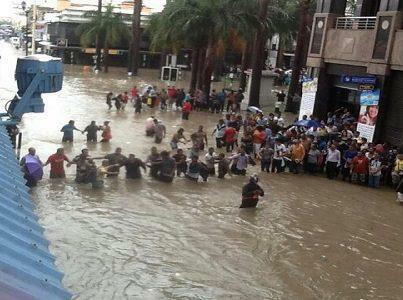 Massive flash flooding in Mauritius has claimed eight lives. The floods have injured 82 others. Six people died in the flooding in Caudan underground tunnel. Several accidents have been reported across Mauritius. Dozens of vehicles collided each other at Port Louis. Lightning strikes have claimed eight lives and injured nine others. Lightning claimed three lives in Chandauli and Meerut each, two in Ghazipur and one in Sambhal. One person is reported to be missing in an avalanche in the Etive Glades, close to Glencoe Ski Centre. Around 30 people including Lochaber Mountain Rescue Team are involved in the search operation. North Dakota Governor has declared a state wide flood emergency. The worst spring flooding is expected on the Red River in eastern North Dakota, USA. Tornado in Hokitika, New Zealand has injured one person. The twister touched down about at 12.30am and tore off roofs from several houses including Railway Hotel Motel in Weld Street. Two people in Shanghai, one of China’s largest cities, died this month after contracting a strain of avian influenza that had never been passed to humans before. The two men, aged 87 and 27, became sick late February and died in early March. Another woman in nearby Anhui province also contracted the virus in early March and is in a critical condition. The strain of the bird flu virus found in all three people was identified as H7N9, which had not been transmitted to humans before. 52-year-old woman succumbed to Swine-flu at civil hospital in Rajkot. Civil hospital sources said that she was admitted into civil hospital three days ago as a suspected Swine-flu patient and her samples were sent for H1N1 laboratory test which came positive. At least 49 people have succumbed to Swine flu in civil hospital in Rajkot since January 2013. Stromboli (Eolian Islands, Italy): Activity remains elevated. A small lava overflow has started from the NE crater, accompanied by relatively strong tremor and explosion signals visible on the seismic signal. Etna (Sicily, Italy): A visit to the summit area and current tremor levels showed the volcano is currently calm. No explosive activity was heard or seen from any of the summit craters. The area of bomb impacts from the last New SE crater paroxysm on 16 March was impressive – the whole area between Torre del Filosofo, the 2002-03 craters and the area of Cisternazza NE of the Cono del Lago was littered with bombs of various sizes (20-50 cm mostly). The Belvedere was found totally covered with scoria and bombs. El Hierro (Canary Islands, Spain): The situation to the west of the island had not changed much and the islanders are in for an uneasy Easter weekend: the seismic swarm continues with frequent and increasingly strong earthquakes and tremor pulses. 15 quakes with magnitudes between 4-4.7 were recorded yesterday alone, the total number of quakes is in the hundreds. A further migration of the hypocenters to the south can be seen, and most quakes remain in the 18-20 km depth layer, with a few in the upper layer at about 10-12 km depth. Inflation has slowed down a bit, but reaches now 12 cm in the western part of the island itself. Grozny (Iturup Island): Tokyo VAAC reported a possible eruption occurred yesterday around 11:00 GMT. A volcanic ash plume was observed at 7,000 ft (2.1 km) altitude and drifting eastwards. Sakurajima (Kyushu, Japan): The frequency of explosions has been comparably low, with 0-2 events recorded per day. Yesterday and today, two stronger ones occurred that produced ash plumes rising up to 10,000 ft (3 km) altitude. Batu Tara (Sunda Islands, Indonesia): An ash plume rose to an altitude of 10,000 ft (3 km) earlier today, sign that sometimes strong explosions continue from the volcano, in permanent eruption for more than 6 years now. 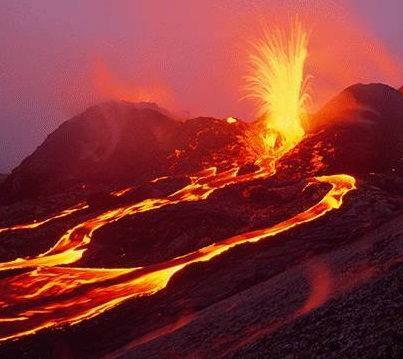 Paluweh (off Flores Island, Indonesia): The lava dome remains very active and produces ash plumes (by a mix of effusive-explosive activity comprising ash venting, explosions, rockfalls and pyroclastic flows from the dome) on a daily basis. The height of the plumes varies mostly between 8-12,000 ft (2.4-3.6 km) altitude. Colima (Western Mexico): The “Volcano of Fire” has become a tourist attraction with now up to 200 weak to moderate explosions per day, and frequent incandescent rockfalls / small pyroclastic flows that descend the flank of the volcano to a length of up to 1.5 km and are a spectacular view at night. Melchor Ursua Quiroz, director of the State’s Civil Protection unit, said that the Fuego de Colima volcano is currently the most active of the country, and has recently increased its explosive activity. In an article in the El Universal newspaper, he “rules out” any risk for the population. A 8 km exclusion zone is in place around the volcano and the governments of Colima and Jalisco are on permanent alert. 5.1 Earthquake hits the Philippine Islands region. 5.0 Earthquake hits New Britain, Papua, New Guinea. Landslide in Tibet has trapped at least 83 mine workers in the gold mining area of Maizhokunggar county of Lhasa. 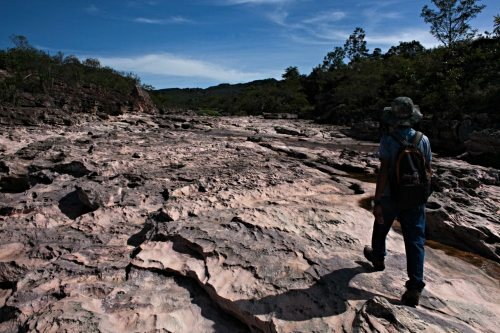 Brazil’s northeast interior has been experiencing a severe drought in what should be the rainy season. Private trucks are selling potable water. Some people travel 100km in search of drinkable water, though many cannot afford to pay the price. “What falls from the sky does not fill a glass of water,” Raimundo, a farmer, said. Natural vegetation, which would normally provide food for livestock, has dried up and many ranchers cannot afford to buy imported feed for their herds. Many farmers are on the brink of collapse, while others have given up on ranching and have moved to other parts of the country in search of work. 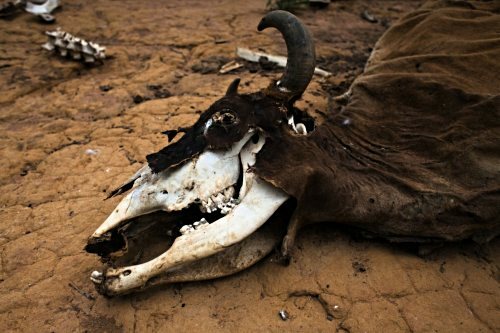 $1bn in aid to all of those affected by the drought has been announced by the Government, but many ranchers are having trouble feeding themselves and their cattle are dying in record numbers. A few cases of a SARS like virus have been reported in Hong Kong. Hong Kong health officials are very concerned about another major outbreak of the disease; similar to the one that happened a decade ago. El Hierro (Canary Islands, Spain): Another large quake of magnitude 4.6, which was widely felt on the island, just occurred at 08:14 GMT at 18 km depth about 10 km west of the island under the seabed. Dieng (Central Java): VSI raised the alert level to the third highest level Siaga (3 out of 4), because significant changes were observed at the crater lake. The most spectacular was the change of the lake water color to dark brown on 24 March. In addition, a significant increase in CO2 concentration within 500 m from the Timbang crater was measured, from from 0.01% (by volume) in early March to 2.5% between 11 and 15 March. Also the emissions of the magmatic gas H2S increased. The now elevated gas concentrations are becoming a significant hazard (illustrated by a cat found suffocated by CO2). Popocatépetl (Central Mexico): An increase in activity occurred last night from 20:05 h local time. Small to moderate explosions with ash emissions started to become more frequent. Incandescent tephra was thrown to up to 400-700 m distances onto the northern and northeastern slope of the volcano (see picture). At 22:30 h, the number of explosions increased to become near continuous. Glowing bombs were ejected up to 700 m distance from the crater and an ash column drifted to the northeast. This process was accompanied by continuous volcanic tremor. Pu’u O’o vent summit cone of Kilauea in Hawaii Volcanoes National Park. © G. Brad Lewis. 5.6 Earthquake hits northern Xinjiang, China. 5.5 Earthquake hits offshore Maule, Chile. 5.1 Earthquake hits New Britain, Papua, New Guinea. 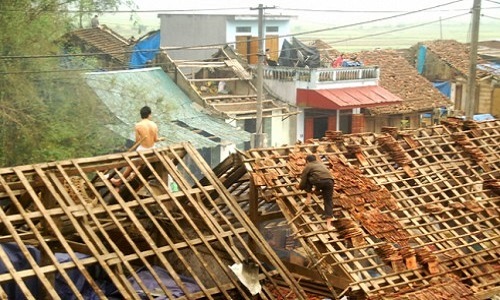 Hail damaged the roofs of more than 10,000 houses in Lao Cai, Vietnam. The hailstorms also injured 26 people. Hailstones were as large as 8-10 cm in diameter. Several areas in northern Taiwan have experienced rare hailstorms Thursday evening. Hail is a rare occurrence in Taiwan. The Taiwan Weather Bureau had issued the first ever hailstorm warning for Taiwan. Six people have died in Hadramout governorate over a two-day period this week on Monday and Tuesday due to floods and heavy rains. 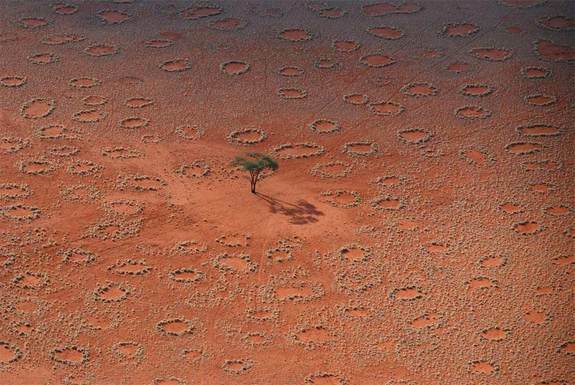 Fairy circles are circular patches of perennial grasses with a barren center that emerge in the deserts along the southwest coast of Africa. 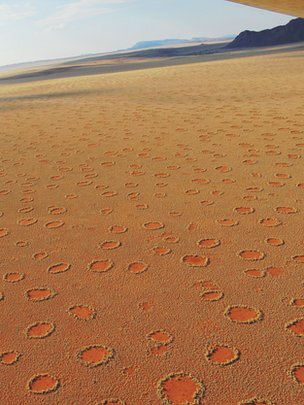 Dotting the Namibian deserts, these rings can persist for decades and occur in regular patterns. Now, research detailed in the March 29, 2013, issue of the journal Science suggests a species of sand termite (Psammotermes) may be the artists behind the grassy artwork. The week’s hottest temperature was 112.1 degrees Fahrenheit (44.5 degrees Celsius) at Matam, Senegal. The week’s coldest temperature was minus 101.6 degrees Fahrenheit (minus 74.2 degrees Celsius) at Russia’s Vostok Antarctic research station. 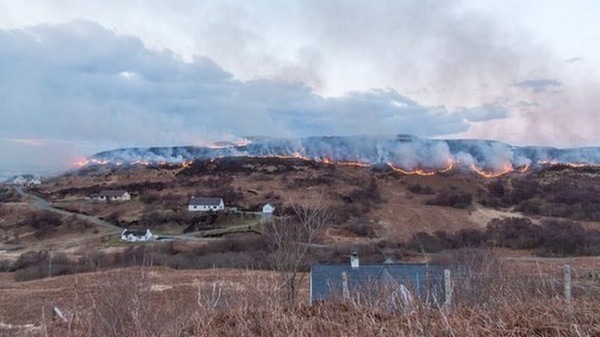 Firefighters have been tackling a number of large wildfires across the Highlands in Scotland. In one area the flames were two miles wide and were so close to the village, the residents were told to be on standby in case they needed evacuate their homes. El Hierro (Canary Islands, Spain): The latest CO2 measurements show a significantly higher than normal level of gas emission, consistent with fresh magma arriving from deeper sources. Another strong pulse of tremor and earthquakes (including a felt 3.8 magnitude event a short time ago) is in progress. The hypocenters of quakes have “dived” to 18-20 km depth, which could suggest a new batch of magma arriving from depth. Tolbachik (Kamchatka): Volcanic tremor increased slightly and lava continues to effuse from the fissure vent and feed two main flow fields. No changes were reported recently for the other volcanoes in Kamchatka: seismicity remains at a moderate level at both Sheveluch and Kizimen volcanoes (lava dome building), while Tolbachik’s tremor overrides the seismic signals from Bezymianny, which also has been effusing its lava dome for years. Paluweh (off Flores Island, Indonesia): The lava dome on the island remains very active with now more or less daily ash plumes observed rising to 10,000 ft (3 km) elevation,- sign that active dome growth continues along with associated rockfalls / pyroclastic flows and explosions / ash venting. White Island (New Zealand): Volcanic tremor is continuous and at high levels. Strong steaming can be seen on the webcam. GNS reported increased CO2 emission (1,950 tons/day on 03 March vs 2,400 tons/day on 26 March), which likely indicates influx of fresh magma at depth. Colima (Western Mexico): Explosions and incandescent rockfalls sometimes forming small pyroclastic flows on the flanks of the volcano remain frequent. The rockfalls from the growing dome provide a spectacular show at night. Popocatépetl (Central Mexico): the current phase of elevated activity continues. Emissions of steam and gas and small to moderate explosions have risen to an average of 3 per hour and sometimes merged into continuous activity yesterday and today. Some of the stronger explosions ejected lava bombs to distances of 1 km from the crater and produced plumes of steam and ash rising up to 1.5 km. CENAPRED also recorded spasmodic tremor segments of high frequency and low amplitude. Fuego (Guatemala): An increase in explosive activity is apparent from the volcano observatory’s daily reports. For the past 24 hours between yesterday and today, 13 explosions (7 weak and 6 moderate in size) were reported with ash plume heights up to 1200 m above the crater. The plumes drifted 8-12 km to the west and southwest and caused light ash falls in the areas Panimaché I and II, Morelia and Santa Sofía. Telica (Nicaragua): The earthquake swarm continues with high amplitude but less frequent quakes. San Cristobal (Nicaragua): A phase of stronger tremor has occurred today. Masaya (Nicaragua): Volcanic tremor has been fluctuating between elevated levels (such as yesterday and this morning) and normal background levels to which is has decreased again now. Machin (Colombia): Seismic activity remains elevated with frequent earthquake swarms. A probably shallow swarm occurred yesterday, but has now eased again. INGEOMINAS locates most volcanic-tectonic earthquakes in an area SE of the dome at depths between 3.5 – 8 km. No surface activity has been observed (yet). Galeras (Colombia): During clear days, steaming and occasional weak ash venting (on 22 and 25 March) was observed. Seismic activity has shown a decreasing trend recently, INGEOMINAS reported. Most earthquakes detected at the volcano recently were related to internal fluid movements and of weak energy. Nevado del Ruiz (Colombia): No significant changes in activity have been reported in recent days. Small bursts of small volcanic-tectonic earthquakes, indicators of frequent small magma intrusions, continue to show up almost daily, and are clustered mostly in an area northeast and northwest of the Arenas crater at shallow depths between 0.5-8 km. Strong degassing accompanies this process at the surface. A large SO2 plume was visible on yesterday’s NOAA satellite data. Reventador (Ecuador): A steam column was seen rising 1 km above the crater yesterday. Seismic activity remains alternating between periods of calm and bursts of tremor / explosion signals.